During the weekend, the cryptocurrency market suffered a bearish fall against the USD. Bitcoin (BTC) fell significantly against the USD carrying the entire cryptocurrency market along. It fell below the $3550 support level. Some cryptocurrencies fell by up to 10% against the USD. Towards the end of yesterday’s trading session, these cryptocurrencies started to recover against the USD. XRP took the lead in the bull run while other cryptocurrencies also recovered slightly. The surge in the price of XRP and other cryptocurrencies may be an indication of a fresh rally this week. After dropping as low as $0.28, XRP started correcting higher until it got to $0.323. At the time of writing, XRP was trading at $0.312090. This shows that it is up by 7.27% against the USD and up by 7.15% against BTC. The trading volume over a 24 hour period is $979,606,603 and the market capitalization is $12,846,720,592. XRP is still the second cryptocurrency per market capitalization. This isn’t the first time the price of XRP is taking such a swing within a short period. In the past, XRP has taken swings downward and upward. XRP has been used as the standard in determining how the market is going to move just like BTC. If the bull rally continues, the entire market will most likely gain more against the USD in the next few trading sessions. 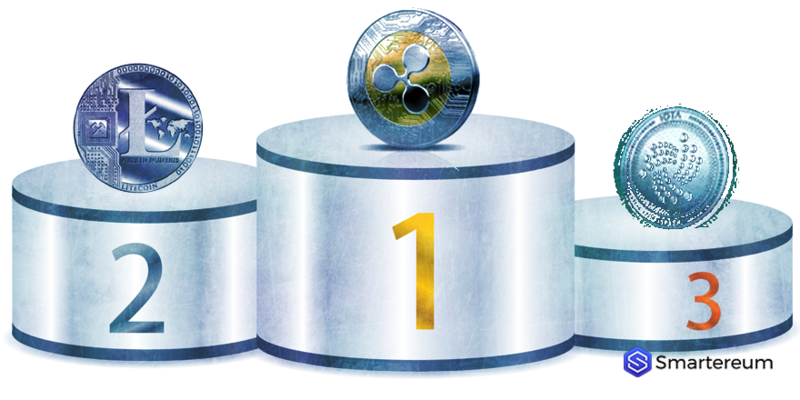 While XRP was the only top cryptocurrency to experience double digit gains during the price surge, it wasn’t the only one to rise. Ethereum (ETH) rose by up to 3% against the USD. At the time of writing, it was trading at $107.58. This means it is up by 1.53% against the USD and up by 1.56% against BTC. The trading volume over a 24 hour period is $2,909,831,730 and the market capitalization is $11,257,830,530. Bitcoin Cash also increased by 6% after hitting a weekly low of $109 earlier in the week. At the time of writing, BCH was trading at $114.73. This means that it is up by 2.48% against the USD and up by 2.60 against BTC. However, BCH is still down by from its seven-day high of $130. Do you think the prices will soon start trading red against the USD or they will be green a little longer?